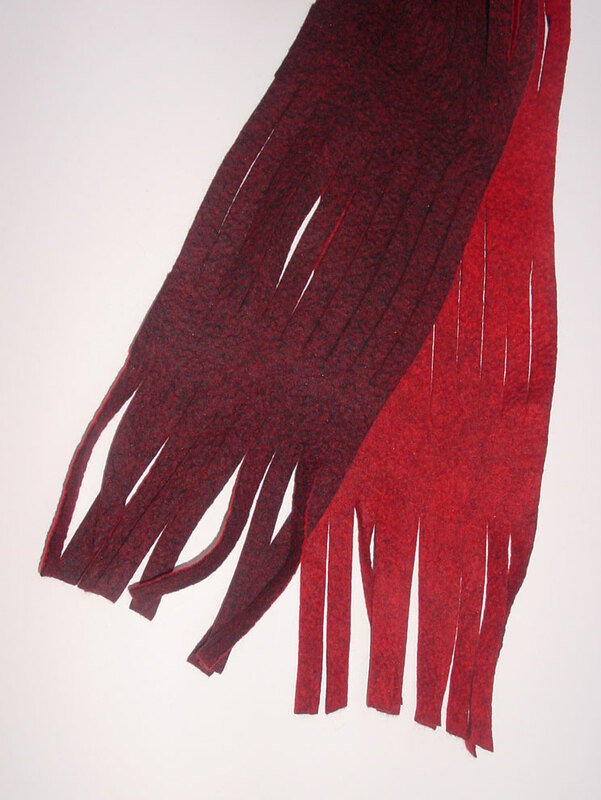 For this scarf a piece of prefelt was felted and fulled using a washing machine. After the felt was dry a rotary cutter was used to trim the scarf to size. The rotary cutter was also used to cut thin strips leaving bands of uncut areas to keep the scarf connected. The strips were cut ~1/2" wide with ~5" long cuts. The bands to keep the scarf connected were ~1 1/2" long. One variation on this would be to cut thinner strips. This scarf is made by felting, not nuno felting, because it is soley prefelt. Finished size: ~ 5" x 64"